Home Tags Posts tagged with "catalonia referendum"
Catalonia has voted in a closely watched regional election, called by Spain following a controversial independence referendum. The snap election pits Catalan pro-independence parties against those who want the region to remain a semi-autonomous part of the country. One exit poll suggested that separatist parties would win a majority. It said the separatist Republican Left of Catalonia (ERC) and the unionist Citizens (Cs) were neck and neck in the race to become the biggest party in the new parliament. Spain dismissed the separatist Catalan government in October after declaring the referendum to be illegal. El Pais newspaper said on its front page that one million undecided voters could have the last word on December 21. Polling stations opened at 09:00 local time and closed at 20:00, with the first official results expected shortly afterwards. At 18:00 local time turnout was 68%, the Catalan authorities said – about 5% higher than the corresponding figure for the 2015 regional election. Most results should have emerged by 22:00 local time. Spain’s Supreme Court has withdrawn European arrest warrants for ousted Catalan President Carles Puigdemont and four other ex-ministers. The former Catalan leaders fled to Belgium a month ago after declaring unilateral independence in a referendum ruled illegal by Spain. Despite the move, the Supreme Court judge said they still faced possible charges for sedition and rebellion. Judge Pablo Llareno announced the warrant’s withdrawal on December 5, citing the willingness the Catalan leaders had shown to return ahead of fresh regional elections being held on December 21. The judge said the European-wide warrant would complicate the Spanish legal probe, and its removal allows Spain to gain full control over the investigation. A Belgian judge was previously expected to rule whether to extradite the ministers on December 14. The five were fighting the move, saying they may not receive a fair trial on their return. Carles Puigdemont has previously said he would return if this was guaranteed. On December 4, six Catalan ex-ministers being held in a prison near Madrid were released from prison on bail. However, two others, including former Catalan Vice President Orial Junqueras, were remanded in custody. Campaigning has now officially started ahead of the new vote organized by Spanish authorities in an attempt to try and resolve the Catalonia crisis. Carles Puigdemont labeled the election as a choice between “nation or submission” while speaking on a video link from Belgium to a rally in Barcelona on December 4. He said voters must chose “between Catalan institutions or dark characters in Madrid”. All but one of the thirteen Catalan leaders sacked by the Spanish government after the independence referendum are standing for election again in the fresh vote. Carles Puidgemont and Orial Junqueras’ pro-separatist parties are campaigning separately in the new vote, after a divide emerged over the future of the region following the nulled referendum. Eight dismissed members of Catalonia’s regional government are facing jail over their role in October’s disputed independence referendum, Madrid prosecutors said. Meanwhile, nine Catalan officials testified at Spain’s high court over accusations of rebellion, sedition and misuse of public funds. Ousted Catalonia’s President Carles Puigdemont and four others disregarded a summons. Carles Puigdemont, who is in Belgium, said the trial was “political”. Spain has been gripped by a constitutional crisis since the referendum was held on October 1 in defiance of a constitutional court ruling that had declared it illegal. Last week, Spain’s PM Mariano Rajoy imposed direct rule on Catalonia, dissolving the regional parliament and calling snap local elections for December 21. This came after Catalan lawmakers voted to declare independence of the north-eastern region. The Catalan government said that of the 43% of potential voters who took part in the referendum, 90% were in favor of independence. Prosecutors asked the high court judge to jail eight of the nine members who turned up for questioning. Those included dismissed deputy leader Oriol Junqueras, Interior Minister Joaquin Forn, foreign affairs chief Raül Romeva and spokesman Jordi Turull. The ninth, Catalonia’s former business minister Santi Vila, should be granted a €50,000 ($58,000) bail, prosecutors said. He resigned before the Catalan parliament voted for independence on October 27. The Catalan leaders are yet to be formally charged. They were accused of rebellion – which carries a maximum 30-year jail term – as well as sedition and misuse of funds. A judge will decide whether the officials should go to jail, pending an investigation that could potentially lead to a trial. The judge can also grant them conditional bail and order them to surrender their passports. Five dismissed Catalan officials stayed in Brussels, including Carles Puigdemont, who had previously said he would not return to Spain if he and his colleagues did not receive unspecified guarantees of a fair trial. Reports suggest some of them requested to appear before the judges via video conference. Carles Puigdemont’s Belgian lawyer told Reuters that he would co-operate with the authorities in Spain and Belgium, but did not appear before the judges because “the climate is not good”. The dismissed leader’s handling of the crisis has drawn criticism among some other Catalan politicians, with left-wing parliamentary deputy Joan Josep Nuet criticizing him for creating “yet more bewilderment”. Meanwhile, five other senior members of the Catalan parliament, as well as speaker Carme Forcadell, are facing the same charges but, because of their parliamentary immunity, their cases are being handled by the Supreme Court. Their hearings have been postponed until November 9. If those Catalan politicians appearing in court are denied bail it will cause further anger among those who want Catalonia to break away. The court summons also gave them three days to pay a deposit of €6.2 million ($7.2 million) to cover potential liabilities. Ousted Catalan leader Carles Puidgemont and 13 other members of his dismissed government have been summoned to appear in Spain’s high court later this week. The court also gave them three days to pay a deposit of €6.2 million to cover potential liabilities. 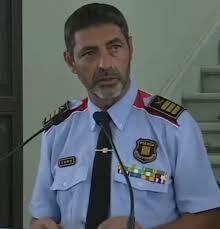 The summons comes after Spain’s chief prosecutor said he would press charges including rebellion. Carles Puigdemont is in Belgium with several former ministers. He earlier said he was not there to seek asylum. Catalonia’s dismissed president triggered a crisis in Spain by holding an independence referendum on October 1 in the semi-autonomous region despite Madrid’s opposition and the Constitutional Court declaring the vote illegal. 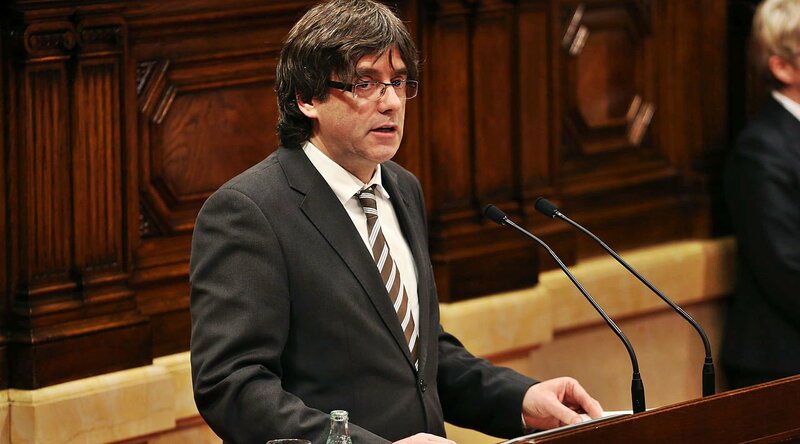 Carles Puigdemont turned up in Brussels on October 30 as Spanish Attorney-General José Manuel Maza called for Catalan leaders to face charges of rebellion, sedition and misuse of public funds. The Audiencia National has now summoned the dismissed Catalan officials – who are yet to be formally charged – to testify on November 2 and 3. If they do not appear, prosecutors could order their arrest. Meanwhile, the speaker of Catalan’s dissolved parliament Carme Forcadell and other former lawmakers have been summoned to the Supreme Court because they still have parliamentary immunity. Carles Puigdemont earlier said he would return to Spain if guaranteed a fair hearing. Several of Carles Puigdemont’s former colleagues who remain inside the country may decide to accept the summons and appear in court. Prosecutors’ arguments against the group were “serious, rational and logical”, Judge Carmen Lamela said in a ruling, according to the AFP. The charge of rebellion carries a maximum 30-year jail term. Speaking at a press conference earlier on October 31, Carles Puigdemont said he was not trying to escape justice by travelling to Belgium but wanted to be able to speak freely. Carles Puigdemont’s comments came as Spain’s constitutional court suspended the declaration of independence made by the Catalan parliament on October 27. The former leader also said he would accept the result of snap elections in Catalonia on December 21, which were called by Spain’s central government after it invoked Article 155 of the constitution, temporarily suspending the region’s autonomy. Spain’s central government has previously said Carles Puigdemont is welcome to take part in the fresh polls. Catalan leaders, including President Carles Puigdemont, have signed a declaration of independence from Spain, following the October 1 disputed referendum. However, the Catalan leaders say the move will not be implemented immediately to allow talks with the Spanish central government. It is unclear whether the document – calling for Catalonia to be recognized as an “independent and sovereign state” – has any legal status. The move was immediately dismissed by the Spain’s government. Catalonia independence referendum – which Catalan leaders say resulted in a Yes vote for independence – was declared invalid by Spain’s Constitutional Court. Earlier in the day, Carles Puigdemont told the Catalan parliament in Barcelona that the region had won the right to be independent as a result of the referendum. According to Catalan officials, the referendum resulted in almost 90% of voters backing independence. However, anti-independence voters largely boycotted the ballot – which had a reported turnout of 43% – and there were several reports of irregularities. National police were involved in violent scenes as they manhandled voters while implementing the legal ruling banning the referendum. Carles Puigdemont told the regional parliament that the “people’s will” was to break away from Madrid, but he also said he wanted to “de-escalate” the tension around the issue. “We are all part of the same community and we need to go forward together. 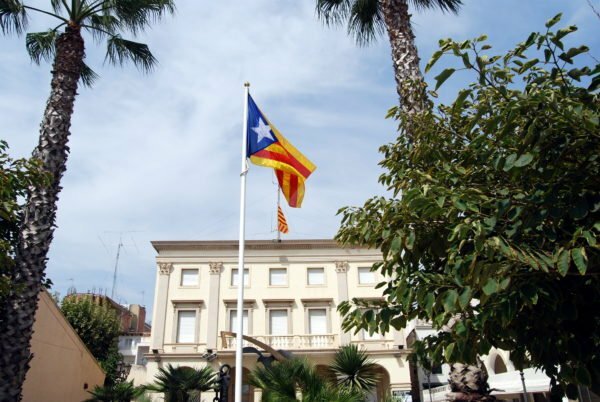 The only way forward is democracy and peace,” the Catalan president told deputies. He also said Catalonia was being denied the right to self-determination, and paying too much in taxes to the central government in Madrid. Spain’s Deputy PM Soraya Saenz de Santamaria responded to the declaration by saying: “Neither Mr. Puigdemont nor anybody else can claim… to impose mediation. Spain’s PM Mariano Rajoy has called an extraordinary cabinet meeting for October 11 to address the latest moves in the crisis. 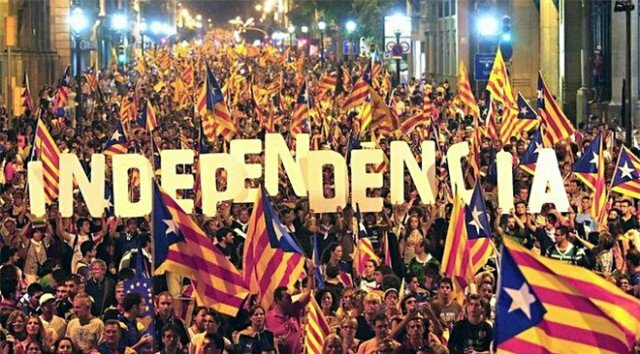 Independence supporters had been sharing the Catalan hashtag #10ODeclaració (10 October Declaration) on Twitter, amid expectations that Carles Puigdemont would ask parliament to declare independence on the basis of the referendum law it passed last month. However, influential figures including Barcelona Mayor Ada Colau and European Council President Donald Tusk had urged Carles Puigdemont to step back from declaring independence. Catalonia, a region of Spain for centuries but with its own distinct language and culture, enjoys broad autonomy under the Spanish constitution. However, a 2005 amendment redefining the region as a “nation”, boosting the status of the Catalan language and increasing local control over taxes and the judiciary, was reversed by the Constitutional Court in 2010. The economic crisis further fuelled discontent and pro-independence parties took power in the region in the 2015 elections. Catalonia is one of Spain’s wealthiest regions, accounting for a quarter of the country’s exports. However, a stream of companies have announced plans to move their head offices out of Catalonia in response to the crisis. The EU has made clear that should Catalonia split from Spain, the region would cease to be part of the European Union. President of the Generalitat of Catalonia Carles Puigdemont says the Spanish region has won the right to statehood following a contentious referendum that was marred by violence. Carles Puigdemont, 54, said the door had been opened to a unilateral declaration of independence. According to Catalan officials, 90% of those who voted backed independence on October 1. The turnout was 42.3%. Spanish PM Mariano Rajoy said Catalans had been fooled into taking part in an illegal vote. According to Catalan authorities, more than 2.2 million people were reported to have voted, out of 5.3 million registered voters. A Catalan spokesman said more than 750,000 votes could not be counted because polling stations were closed and urns were confiscated. In a TV address, Carles Puigdemont said: “With this day of hope and suffering, the citizens of Catalonia have won the right to an independent state in the form of a republic. He said the EU could no longer “continue to look the other way”. Meanwhile, PM Mariano Rajoy spoke of a “mockery” of democracy. “At this hour I can tell you in the strongest terms what you already know and what we have seen throughout this day. There has not been a referendum on self-determination in Catalonia,” he said. In another development, more than 40 trade unions and Catalan associations called a region-wide strike on October 3 due to “the grave violation of rights and freedoms”. TV footage showed Spanish police kicking would-be voters and pulling women out of polling stations by their hair. Catalan medical officials said 844 people had been hurt in clashes, including 33 police. The majority had minor injuries or had suffered from anxiety attacks. In Girona, riot police smashed their way into a polling station where Carles Puigdemont was due to vote, and forcibly removed those inside. He voted at another station. Barcelona Mayor Ada Colau condemned police actions against the region’s “defenseless” population, but Spain’s Deputy PM Soraya Saenz de Santamaria said police had “acted with professionalism and in a proportionate way”. Catalan authorities said 319 of about 2,300 polling stations across the region had been closed by police while the Spanish government said 92 stations had been sealed off. Since September 29, thousands of people have occupied schools and other buildings designated as polling stations in order to keep them open. Many of those inside were parents and their children, who remained in the buildings after the end of lessons on September 29 and bedded down in sleeping bags on gym mats. The anti-independence Societat Civil said there were voting irregularities, including the same people voting twice. Catalonia is a wealthy region of 7.5 million people in north-eastern Spain and has its own language and culture. However, Catalonia has a high degree of autonomy, but is not recognized as a separate nation under the Spanish constitution. Catalonia is holding an informal poll on independence. The Spanish judiciary has ruled the vote unconstitutional but Catalan leader Artur Mas warned against any attempt to disrupt it. Spain’s constitutional court suspended earlier plans for a referendum on secession. PM Mariano Rajoy said the vote would have no effect and urged the region to return to “sanity”. 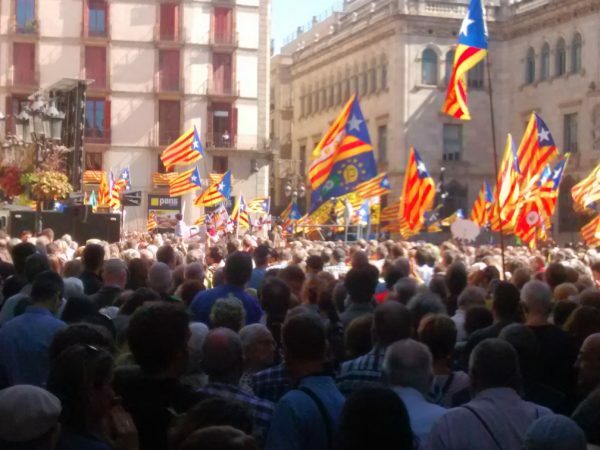 Voters will be asked whether they want a Catalan state and whether that state should be independent. Catalonia is a wealthy a region of 7.5 million people and contributes more to the Spanish economy than it gets back through central government funds. Economic and cultural grievances have fuelled Catalan nationalism. He says there is a long history of support for winning independence from Spain, or at least much greater autonomy within it. This week, the Constitutional Court demanded the vote be suspended. Catalonia’s government insisted it went ahead, organized by volunteers and with no official electoral roll. Artur Mas warned the Spanish government against any attempt to halt the vote. Mariano Rajoy urged a return to sanity and for talks “within the legal framework of the constitution”. He said the vote would be “neither a referendum nor a consultation nor anything of the sort”. The Libres e Iguales (Free and Equal) group, which opposes the vote, held protests in dozens of cities. One protest in Barcelona witnessed minor scuffles but no arrests. Rallies in favor of the vote have also been held.